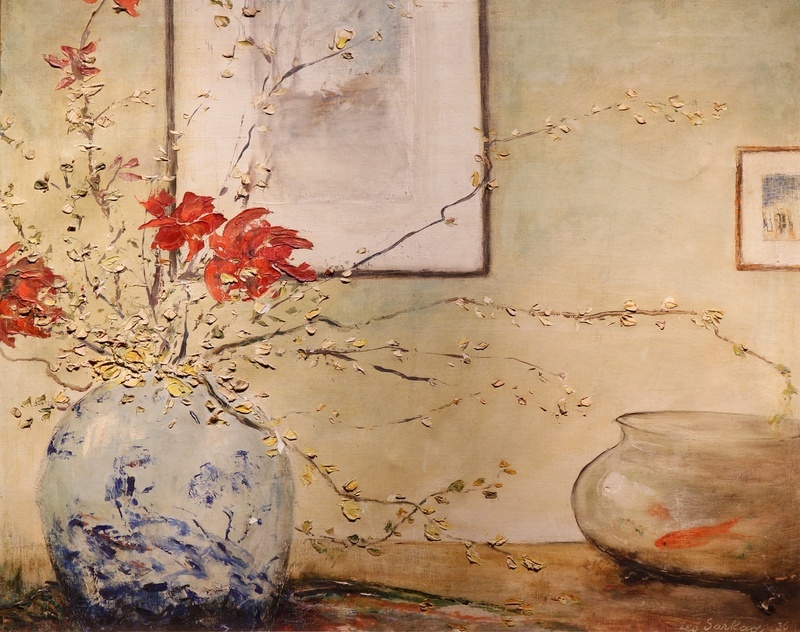 A striking composition is achieved with very few objects: the painting’s eponymous vase, a few flowers and blooming limbs, a goldfish bowl, and two paintings. Carefully outlined shapes play against a scattering of colors applied thickly—even three-dimensionally—to the canvas. A branch traces the meandering line between a vivid goldfish in the bowl and equally bright flowers held by the jar. The painting at left creates a window upon some outdoor scene. About the Artist: Born in Budapest, Hungary, Sarkadi relocated first to London and then, in 1914, to the US. His artistic life began as a dramatist, writing one-act plays that spanned his time in both countries: Within Four Walls (1900), Children at Play (1907), The Line of Life (1916), The Gusher (1928), Fourflusher (1928), and The Angel (1929). One published collection of these plays, however, features illustrations that may be Sarkadi’s and would indicate a longstanding interest in the visual arts, although his painting career dates to the early 1930s. He also exhibited sculptures on more than one occasion, showing himself to be a multitalented artist. Sarkadi’s paintings were shown at the Balzac Gallery, Ainslie Galleries, and the American Artists Congress. His friend Willy Pogany, a fellow artist from Hungary, wrote how “it is strange that a man so saturated with transcendental philosophy antagonistic to matter, should take up painting as a means of expresssion...But with Sarkadi the process is different....Color attracts him just as much as form is evaded, and here we find that his instinctive choice of vehicle for the mysticism and yearning for limitless space is more than justified by the result” (New York Sun 10 May 1924: 6). 3 works at the Brooklyn Museum. 12 more images at FAP. Sarkadi-Schuller, Leo, 1879-1947, “Chinese Jar,” OpenValley, accessed April 25, 2019, https://openvalley.org/items/show/1211.